It's finally safe to visit Montpelier VA-- the historic home of James Madison, our fourth president. Why "safe"? For a few years, I recommended that you save your money and hold off visiting the estate until they were done with massive renovations-- $24 million in renovations, to be exact. 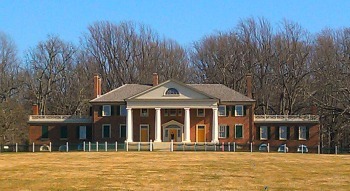 James Madison's home, Montpelier, as it looks now after renovations. That time finally came. Having removed two huge wings added by the Dupont family, and taking Madison's original building down to bare studs so it resembled nothing more than an impoverished skeleton, the foundation that runs the mansion finally has it where it's not a crime to pay the hefty admission fee (more on that later). But it's still not a cheap visit, so read on for details on what you'll see--plus ways to get in for less--before you plan your visit. First, here's a little history about Madison and his house. 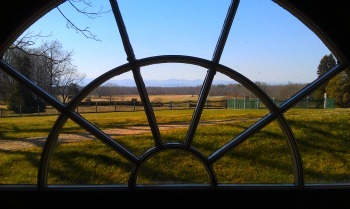 A window from the cellars at Montpelier. 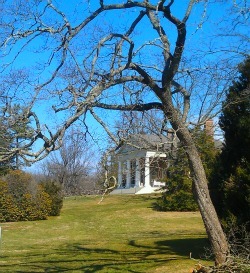 Originally a tobacco plantation, Montpelier was the life-long home of James Madison. He spent his childhood there, and returned after marrying his wife, Dolley (yes, that Dolley Madison). After his presidency, returned to the estate and died here in his study in 1836. Built in 1760, Montpelier VA was originally a 10-room Georgian mansion. After his marriage, he added two flanking wings. However, to get into the wings you had to go out the front door and step into the wings from separate entrances (guess he had a mother-in-law!). Aside from being known as the first "First Lady," Dolley Madison is famous for saving the portrait of George Washington when the British burned down the original White House during the War of 1812. She also founded an important White House tradition: the annual Easter Egg Hunt on the South Lawn. Anyway, four years after Madison died, Dolley sold the house and moved back to Washington. The house was owned by six families over the next 50 years. The rooms were stripped down to bare studs. When the Dupont family purchased it, they added 30 rooms to Madison's 20 room mansion. Marion Dupont Scott gave the house to the Montpelier Foundation upon her death in 1987, with the request that it be returned to the way it looked during Madison's time. Today the estate features the mansion, some historic buildings, exhibits on Madison and the Dupont family, archaeological sites, gardens, a Visitor Center, barns, horse-racing fields, and a freedman's cabin and farm. Now you can argue (as I do) whether it was worth $24 million to tear down those renovations and restore Montpelier VA to exactly how it looked during Madison's time. But at least now you have something to look at when you enter the mansion. For several years, if you were expecting the $22 admission fee to buy you room after room of completely-furnished interiors with lots of authentic artifacts (like at Thomas Jefferson's Monticello) you would be disappointed, although in the last few years they have slowly been bringing in more furniture and artifacts and generally making it look lived in again. 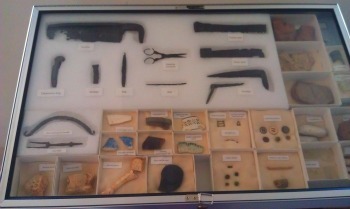 The Montpelier mansion doesn't have many artifacts, like these. Quite a few rooms are now furnished as they were during Madison's time, include the parlor, dining room, the bedroom where he died, and a study. Some are still empty except for displays which discuss things like the War of 1912, the Federalist Papers, and spy craft during the time-period. Even in the furnished rooms, most of the furnishings are of the time period or clever reproductions. Only a very few of the furnishings definitely belonged to Madison. I first went to Montpelier VA on the 257th anniversary of James Madison's birth. To celebrate his life, the foundation offered free admission to all visitors. It was a good thing. While the introductory audio/visual lecture about the renovation was intriguing, the visit to the house was such a let-down that I would have been supremely ticked off had we had to pay $12 each to see bare studs, plaster, and drop cloths. Full price or not, the docent on our tour was excellent-- engaging and extremely well-informed-- and we did learn a lot about Madison, the other founding fathers, and the Revolutionary War. And I wish I could show you photos of the inside of the estate to help you make up your mind, but photography inside the mansion is forbidden. 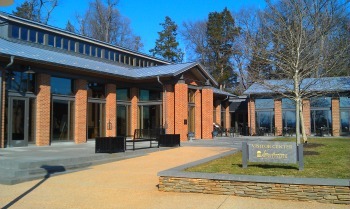 The Visitor's Center at Montpelier has a 10-minute film, gift shop, exhibits, cafe and more. If you really want to go cheap, take advantage of their free "Journey from Slavery to Freedom" walking/driving tour which is offered Saturdays at 2:30 pm. You won't get to visit the house, but you'll get to learn some history and enjoy the beautiful grounds. A great place for a picnic! 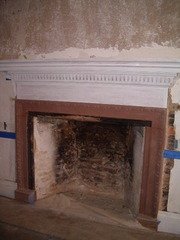 For more info, check out the Montpelier website.